The transport chapter is certainly one of the most complex and articulated. 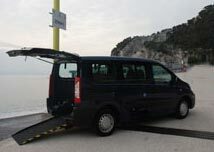 There are various types of accessible transports: by van with or without driver, by coach, train, ship, plane. 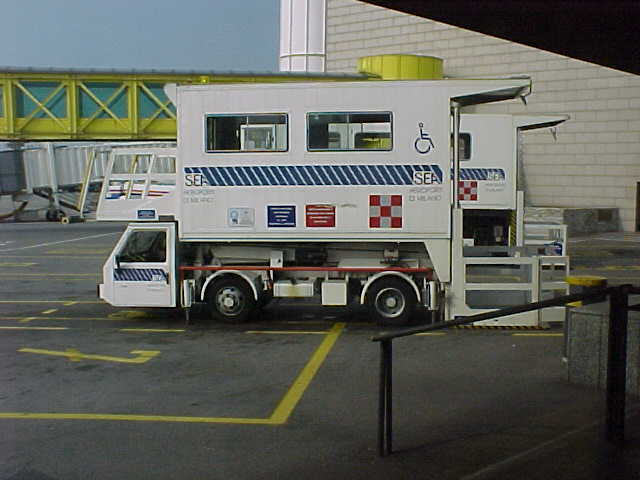 The accessibility of certain transports, such as planes or ships is out of the limits of our intervention, but for almost all other transportation means available we try our best to provide 100% accessible vehicles. In Europe and in most Western Countries the most widely accessible transport is made up of vans with hydraulic platform or tail/side ramp. Vans in Europe can bring a maximum of 8 people plus the driver. They are typically Mercedes Sprinter, Ford Transit, Fiat Ducato, Renault Master and similar vehicles. 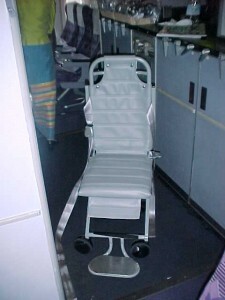 Typically they can take on board up to a maximum of 3 wheelchairs hooked but in most cases the chairs are only 1 or 2. In the UK countries there are cars, taxis as London Cabs, allowing access on board by the side door of a wheelchair while people with small manual folding chairs and able to move on a seat can use normal taxi rated by meter. 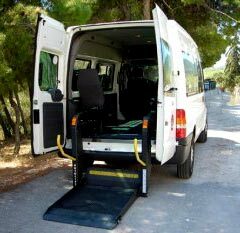 In non-Western countries the availability of accessible van is much more sparse but are still available media platform with ramps in some countries in Central and South America. In some countries in Southeast Asia like Thailand, Singapore, Malaysia, Bali (Indonesia) are available accessible vans while in others only grown solutions. 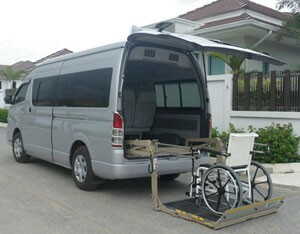 Accessible vans are available in Japan, Hong Kong. In Africa the situation is bad with the exception of South Africa, Namibia and some realities of East Africa, the Middle East with the exception of Israel and Turkey. Good situation in Australia and New Zealand. In general it can be said that wherever there are vans with platform or ramp available even tourists who use a wheelchair with batteries could travel, in other countries only tourists with manual collapsible wheelchairs and better if they will be possibly move (with help) to a vehicle seat. There are also larger vans up to 12/14 people but generally the chairs on board does not exceed 3. For larger groups there are coaches with lifting platforms that can carry up to 20/30 people plus up to 6/8 chairs hooked on board. 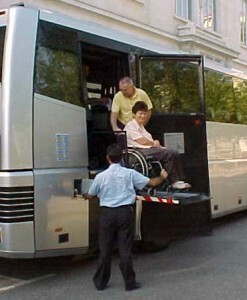 The demand for accessible transportation, hired without a driver, is increasing, however, the fleet is very limited, companies that hire this type of transports, are small companies, and not the big rental companies: Avis, Hertz, Europcar, .. . which avoid to operate in a complex market. The result is that, for example, you can not typically pickup the car in a place and drop off it in another, maybe in another country, unless without high delivery and collection costs (sometimes more than the cost of the rental itself) . So the advice is to worry first about the rent and on the basis of what is to organize the flights and the other services. 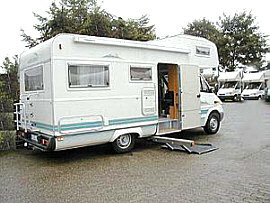 A separate section of the available vehicles is represented by campers and motorhomes: they are very rare, very expensive, available in very few countries. In Italy there a couple of them with 5 berths each, they are more populare in the UK. Fairly common in some countries also distributed by some of the large rent-a-car multinationals companies; but generally in this market too, charterers are small companies. The major problem is the fact that the hand controls are generally very customized, they are produced from different companies in each Country so often the driver is not accustomed to the hand controls available in the country where he/she’ll rent the car. With rare exceptions, such as large cruise ships and the few accessible houseboats existing, vessels are poorly accessible. The limited space available and the overlapping of decks connected by ladders steep does not herlp a person in a wheel chair to enjoy its holiday. There are rare examples of accessible sailing boats created by organizations but are typically for day use sailing courses more than for several days cruises. The tourist boats are available in many European cities, first of all, Venice whose “vaporetto” are generally accessible and is now about to be launched soon an accessible “gondola”, Paris “Bateaux Mouches” are accessible too as Amsterdam with some boat tours of the canals, etc. Are generally not accessible river cruise ships sailing the great European rivers (Rhine, Danube, Moselle, …) except for a couple of ships that have an accessible cabin but the interior spaces are limited. Most of the ferries are accessible, such as those linking Italy to Sardinia, France to Corsica, Spain to Balearic Islands, some ferries in the Mediterranean, the ferries in the Baltic Sea connecting Danemark to Norways, Sweden to Finland and Finland to the Baltic Republics. Many coastal boats along the North America cost have accessible cabins too, and in some other Countries in the world, but for which we have no information. The big cruise ships that sail the seas of the World are accessible environements. Cruise ships have become, in a few years, one of the most accessible tourist habitat with 10 and more accessible cabins that open onto large decks connected big big lifts, all areas accessible to 100%. The dream ends when the shore excursions begin. When you meet the inaccessible reality of the cities you’ll like to visit as the other passengers. In most ports ships go to the piers, but in some cases the ship stay in the bay and the passengers will desembark by tenders, not accessible to all types of special needs passengers. Organized excursions by ships are by default NOT accessible. AccessiblEurope organizes accessible shore excursions from all major European ports of the Mediterranean, Atlantic, North Sea and Baltic Sea as well as from major ports in South East Asia. There are in few European countries (France, UK, …) very few houseboats available that allow you to navigate along river routes and channels and to stay overnight on board in small groups of 4/6 people. They are equipped with a lift platform so the person in wheelchair can access the lower deck where the berths, the kitchen and accessible toilet are. The spaces even in these cases are very limited and accessibility to a large wheel chair with batteries has to be checked very carefully. They are accessible through the assistance provided in the main stations by railway staff with portable lifts. Are not generally accessible secondary stations, the local and regional lines, the night trains with bunks and wagoon lits. Railways fees provide facilities for persons with disabilities but are generally required cards for entitlement to benefits. In some countries, like in Italy, the high-speed train could be an alternative to other forms of transport between towns and cities for travelers in small parties, up to 6 pax with maximum 2 wheelchairs. 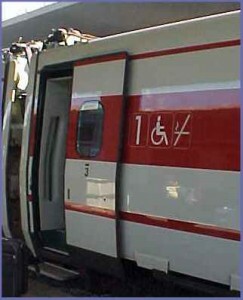 The coaches with room to hook the wheelchairs, usually 2 chairs for each train, also have accessible toilet. The assistance must be booked, together with the ticket, as soon as possible. AccessiblEurope can book most of the European speed trains and the related assistance at departure and arrival. With the spread of the “low cost” airlines is dramatically increased air traffic even for short routes that are now as competitive price with that of high-speed railways. Air transport for people with disabilities is organized on the basis of categories, established by IATA, related to the level of assistance required: WCHR, WCHS, WCHC. The passenger in a wheelchair, unable to move independently, falls into the category WCHC (the more assisted one). There is a maximum number of passengers, of these 3 categories, who can board simultaneously on a flight. The number is related to the type of aircraft and established by the airline. The procedures are standardized, and, consistent with the technical equipment of the airports involved, very similar everywhere. Assistance on arrival and departure is provided by the airport management company in collaboration with the airline that has received the notification at the time of booking the flight. The passenger’s wheelchair is stored as luggage at the check-in and returned upon arrival at the baggage claim. The power wheelchairs must be equipped with gel batteries (which can not release liquids), they should have the electrical contacts blocks and be adequately protected to prevent damage (especially to the electronics and controls). The conditions upon return should be checked immediately and any damage must be reported with a written reports (PIR) before leaving the baggage claim area. Often companies “low cost” flying from remote airports to the destination and this can affect the cost of transfers available. On intercontinental flights, it is possible that the disabled passenger must be compulsory with a caretaker. The crew does not pay, for insurance reasons, personal assistance to people with disabilities. The toilets on board, even those with the logo of a wheelchair, have absolutely minimum dimensions and using them could be a problem. 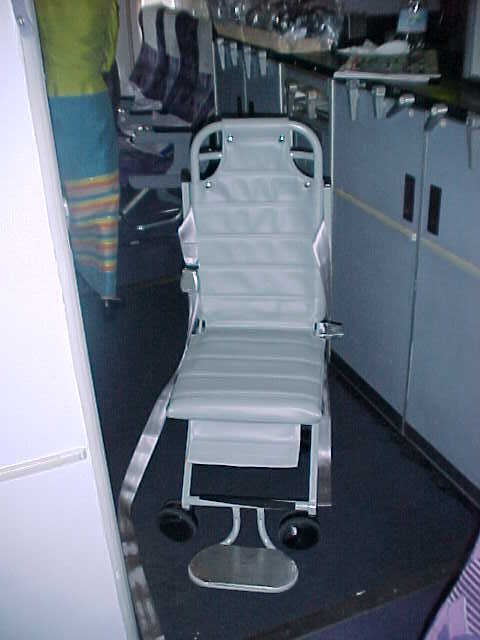 The larger aircraft typically have a small wheelchair passing in the aisle and that is used to accompany people with disabilities to the toilet.